Jason Statham continues to audition for the 007 role he’s never, ever going to get (not that I think he’s bad, it’s just… does he LOOK like someone who would ever work for Her Majesty’s Secret Service?) with a sequel that nobody ever asked for to a remake that nobody ever asked for, that of the 1972 Michael Winner action-thriller The Mechanic. Originally starring Charles Bronson, it was updated in 2011 where Statham would take on the Bronson role as a contract killer who is paid to bump off targets and make them look like accidents, and while it wasn’t anything to shout from the rooftops about I found it to be a more sombre and even interesting Statham action movie than it had any right to be. Either way, it wasn’t just another generic action movie that happened to have someone like Statham starring in. No, that’s what Mechanic: Resurrection is for. A major step backwards from something that wasn’t even that great to begin with, Resurrection has no real reason for existing, since the previous film was neither critically acclaimed (53% on Rotten Tomatoes) nor even that big of a box office success ($62 million worldwide against a $40 million budget), and for me it was impossible to get those statistics out of my head, as I was trying to justify why I was even in a cinema watching this sequel. Alas, I was stuck watching an action movie with the most generic of plots, and with almost no connection to the previous film other than it once again stars Jason Statham as Arthur Bishop, a character that wasn’t even originally is. Bishop this time seems to have gone off the grid entirely, hiding out in several locations around the world from Brazil to eventually Thailand, where through several complicated contrivances manages to partner up with a pretty American woman named Gina (Jessica Alba). Their short-lived romance turns into exactly that, when Gina is kidnapped by a villain so generic and forgettable that I can’t remember his name even when I check it online (Sam Hazeldine), who offers to give her back once Bishop completes three different assassinations across the world, in several locations including Malaysia, Australia, and Bulgaria – basically, anywhere that the writers could think of that ended with “ia”. This takes up the rest of the movie, which sees Statham doing what audiences apparently expect out of a Statham film, albeit one of the lower-quality and sometimes direct-to-DVD ones. Say whatever you want about the 2011 Mechanic film, but at least that one had a consistent tone that managed to carry on throughout its entire running time. This one doesn’t even want to associate itself with any kind of tone, and it ends up feeling all over the place without the smarts or thrills to back it up; the silly moments it takes way too seriously, and the serious parts are sometimes unintentionally funny, with no in-between for anyone that wants to be entertained by even the stupidest of action movies. Instead, Resurrection is way too stupid and even boring to become fully invested in, no matter how dumb it ends up becoming as it draws nearer a conclusion. By the time we get to an assassination that involves a swimming pool with a design so nonsensical you’ll end up wondering what architect would even sign off on something this ridiculous, you’re counting down the minutes until the hero we’re meant to be following works his way to an unavoidable shoot-‘em-up climax. I’m usually more lenient towards a dumb action movie like this, but only when its entertainment values are high enough to mask its more obvious flaws and clichés, something that this film utterly fails to do for me. Statham may be front and centre as his usual Statham-y self, but some of the big names they brought in to provide supporting roles are actually baffling, especially when they are mostly pointless and serve almost no purpose to the plot other than the most stock of character attributes. Tommy Lee Jones, for example, gets roped into the third act as, I’m guessing, a rejected Bond villain from the Roger Moore era (he even dresses like one, too), and surprisingly looks like he’s enjoying himself more here than in Jason Bourne; meanwhile, Michelle Yeoh has absolutely nothing to do here, other than act as someone for Statham to intermittently have a conversation with. On the other hand, I can see exactly why Jessica Alba would appear in something like this, and I’m sorry but she has not improved her skills as an actress at all (as ever, she’s distractingly one-note, and she shares very little chemistry with the more charismatic Statham, especially when she’s trying to make small talk that comes across as so forced and unnatural). I do genuinely feel bad, as I’m sure she’s a nice person, but in my honest opinion, an actress she ain’t. 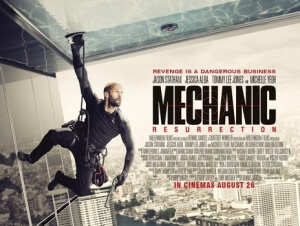 In a year where sequel after sequel has underperformed, it would not surprise me if when Mechanic: Resurrection meets the same fate; it’s just too dumb for its own good. Mechanic: Resurrection is a completely unnecessary action sequel that is far too dumb for its own good, with ridiculous set-piece after ridiculous set-piece failing to excite and instead bore even the biggest action movie fan, something that not even the charismatic Jason Statham can save this time around.